What is Epicyclic Gearbox – Main Components, Working and Application? “Automatic is the new need of the 21st century” yes it is, when it comes to human comfort various researches is being done to decrease the human effort in operating the machines though the manual transmission has its own benefits but some people find it causes fatigue to the driver in operating the clutch and shifting gear continuously during a drive which raises questions like why do we need clutch? Why there are limited torque and speed ratios? , Which leads to the introduction of automatic type gearbox named Epicyclic gearbox. An Epicyclic gearbox is an automatic type gearbox in which parallel shafts and gears arrangement from manual gear box are replaced with more compact and more reliable sun and planetary type of gears arrangement and also the manual clutch from manual power train is replaced with hydro coupled clutch or torque convertor which in turn made the transmission automatic. The idea of epicyclic gear box is taken from the solar system which is considered to the perfect arrangement of objects. The epicyclic gearbox usually comes with the P N R D S (Parking, Neutral, Reverse, Drive, Sport) modes which is obtained by fixing of sun and planetary gears according to the need of the drive. Why do We Need Epicyclic Transmission? In countries like India there is a problem of traffic which required sudden shifting of gears from high torque to high speed which in turn requires continuous engagement and dis-engagement of the clutch which causes fatigue to the driver. Poor fuel economy is the problem seen with the synchromesh manual transmission as there is the loss of energy due to the movement of lots of components and also over raving of accelerator is also seen in it. 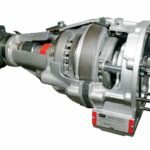 Since, the parallel shafts with mounted gears and meshing devices are used in manual transmission so size of the gearbox becomes the problem. 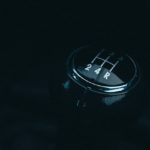 When we talk about manual synchromesh transmission we can have maximum of 6 gear ratios but it is found that a car requires more than 6 gear ratios in a long run. If we take an example of the latest manual transmission system i.e. synchromesh gearbox in which the shifting of gears is obtained by sliding and meshing of synchronisers with the constantly meshed pairs of gears which causes wear and tear to the transmission system. 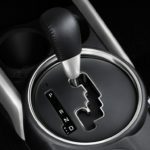 Also in manual transmission the shifting of gear is a noisy process. So with these problem in mind General Motors developed the first automatic transmission in 1930 by using epicyclic gear train with hydraulic coupling which was boom in the luxury cars world. 1. 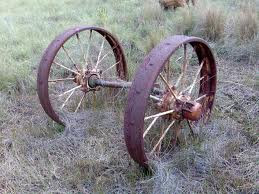 Ring gear- It is a type of gear which looks like a ring and have angular cut teethes at its inner surface ,and is placed in outermost position in en epicyclic gearbox, the inner teethes of ring gear is in constant mesh at outer point with the set of planetary gears ,it is also known as annular ring. 2. Sun gear- It is the gear with angular cut teethes and is placed in the middle of the epicyclic gearbox; the sun gear is in constant mesh at inner point with the planetary gears and is connected with the input shaft of the epicyclic gear box. One or more sun gears can be used for achieving different output. 3. 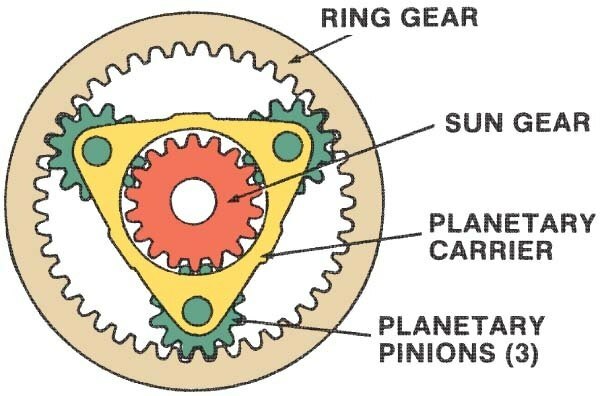 Planet gears- These are small gears used in between ring and sun gear , the teethes of the planet gears are in constant mesh with the sun and the ring gear at both the inner and outer points respectively. The axis of the planet gears are attached to the planet carrier which is carrying the output shaft of the epicyclic gearbox. 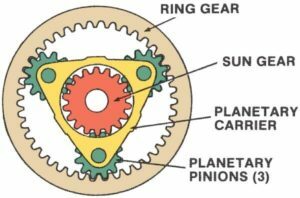 The planet gears can rotate about their axis and also can revolve between the ring and the sun gear just like our solar system. 4. 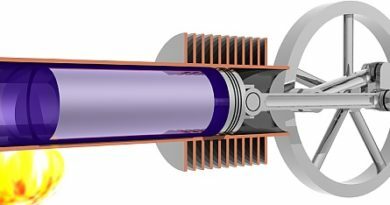 Planet carrier- It is a carrier attached with the axis of the planet gears and is responsible for final transmission of the output to the output shaft. The planet gears rotate over the carrier and the revolution of the planetary gears causes rotation of the carrier. 5. Brake or clutch band- The device used to fix the annular gear, sun gear and planetary gear and is controlled by the brake or clutch of the vehicle. This provide high torque ratios to the vehicle which helps the vehicle to move from its initial state and is obtained by fixing the annular gear which in turn causes the planet carrier to rotate with the power supplied to the sun gear. This provides high speed ratios to the vehicle which helps the vehicle to attain higher speed during a drive, these ratios are obtained by fixing the sun gear which in turn makes the planet carrier the driven member and annular the driving member in order to achieve high speed ratios. 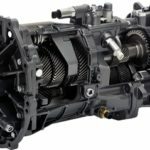 This gear reverses the direction of the output shaft which in turn reverses the direction of the vehicle, this gear is achieved by fixing the planet gear carrier which in turn makes the annular gear the driven member and the sun gear the driver member. Note- More speed or torque ratios can be achieved by increasing the number planet and sun gear in epicyclic gear box. Epicyclic gear train is usually used in automatic vehicles with the hydraulic clutch. It is used Lamborghini Gallardo. It is also used in power transmission between I.C engine and electric motor, so it also has its uses in hybrid cars.